This is a photo from Improv Everywhere. They're a comedy troupe based in NY, NY that stages stunts and pranks, from setting up a "Meet a Black Person" booth (pictured below) in 99.5% white Aspen, CO, to flooding a Best Buy with "Agents" dressed like employees. Take some time and read over the various missions they've staged- my favorites are The Moebius, Slow-Mo Home Depot, all the "No Pants" missions, and this awesome black guy. Check out the video for him- a man shouts "Hey, Mom! 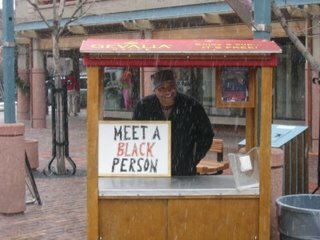 There's a black guy down here!! ", and one guy takes his picture with him.